In August 2006, the Chicago Yoga Center (and Suddha Weixler) hosted Srivatsa Ramaswami to teach a one-week Vinyasa Krama Teacher Training certification program. The vinyasa krama method was taught to Ramaswami over many, many years of study with his teacher, Sri T. Krishnamacharya. It is important to realize that for over 30 years, Krishnamacharya continued to impart the wisdom of all the vast, essential aspects of yoga to Ramaswami, including Sanskrit chanting, the important yogic texts and the many elements and practices contained in the components of the eight limbs (astanga) of yoga (yama, niyama, asana, pranayama, pratyahara, dharana, dhyana, samadhi). Ramaswami began each of our classes with a Tamil chant to Ganesha (an elephant-headed deity) and a Sanskrit chant to Patanjali, which set a peaceful yet serious tone for the class. He sometimes ended our class with ten minutes of Vedic chanting, often from his Mantra Puspam (pronounced “push-pum”; the word means “flower,” but it is a book of Vedic chants and mantras). He told us that he chanted many times with Krishnamacharya, even in the last year or so of his life when his teacher was unable to get out of bed. Krishnamacharya, he said, would always chant from memory, while Ramaswami himself would read from his Mantra Puspam. According to Patanjali’s yoga sutra I-2, the goal of yoga is freedom. In the teacher training, Ramaswami created a tapestry of yoga practices for the participants. By using Patanjali’s Yoga Sutras and other ancient texts, Ramaswami gently and thoughtfully brought each thread back to the main goal. Asana, pranayama, pratyahara (withdrawal of the senses), meditation, mantras, etc., were all discussed with kaivalya in mind. When kaivalya has been reached, the three gunas, or qualities of nature, that constitute the mind (citta), fall into a state of equilibrium and become quiescent. (The three gunas are tamas [inertia, heaviness of mind], rajas [action, fickleness of mind] and sattva [lightness, clarity of mind]. Even the sattvic state of mind must eventually be overcome. This is the translation of a saying in Tamil (a South Indian language), which is Ramaswami’s native tongue. He learned this saying at a young age. This concept can be applied throughout a yoga practice to assess one’s own progress. How jumpy is the mind? How many times was it distracted? Are you feeling relaxed and comfortable in a posture? The Sanskrit syllables for vinyasa krama are defined in this way: vi – variation, nyasa – within prescribed parameters, and krama – sequence. When we practice asana with steadiness and comfort, as recommended in sutra II-46, we will be able to sit comfortably in a posture for a long time, do pranayama for one hour and then meditate. The sequences have beautifully flowing variations and movements arising out of one main posture. There are dozens and dozens of variations within each sequence. They are taught in a precise order. Ramaswami introduced us to the ten main sequences, which are: the standing series (tadasana); the one-leg seated postures; posterior stretch (paschimatanasana); one-leg standing postures; supine postures; prone postures (dhanurasana, or bow pose); triangle (trikonasana); “topsy-turvy” poses (as Ramaswami calls them), which are also known as viparita karani, or inverted postures; meditation (vajrasana); and the lotus pose series (padmasana). He also taught us some of the minor sequences, including the sun salutation (surya namaskara) with chanting, which is traditionally done on Sundays, the salutation to all directions (ding namaskara) with chanting, and a few others. These sequences and their variations, as well as the Sanskrit prayers for surya namaskara and ding namaskara, are set out in generous detail in Ramaswami’s book The Complete Book of Vinyasa Yoga. If the breathing rate does not slow down over the course of one’s asana practice, one is not doing yoga, but ordinary exercise. Ujjayi breathing helps the abhyasi (yoga practitioner) hear the breath and keep the mind focused. It is to be done during both the asana and the pranayama practices. Ujjayi breathing requires a slight constriction of the throat, which creates a quiet hissing sound. The mouth is closed during both the inhalation and the exhalation. This is the way Ramaswami taught us to practice kapalabhati: First, sitting in a comfortable position with our heads down, our chins in jalandhara bandha (the chin lock) and our hands resting on our knees, we repeated kapalabhati 36 times. Then, after we rested for a moment, we raised our arms above our heads on an inhale, interlocked our fingers, reached our palms toward the sky, and did 36 more kapalabhati. Then we rested again. Finally, with our elbows bent and our hands resting on the opposite shoulder blades behind our heads, we repeated kapalabhati for a third round of 36 times. This made a total of 108 times, which is the number of repetitions Ramaswami recommends. This (along with proper diet) helps the yogi achieve a more sattvic state (which manifests as a light feeling in the body and a clear mind). After our asana and kapalabhati practices, Ramaswami had us practice pranayama. We did this twice a day. Ramaswami introduced a new element or a different type of pranayama each time. The ratio we practiced was 5:5:10:5. He asked us to inhale for a count of 5, hold after inhale for a count of 5, exhale for a count of 10, hold the breath out after exhale for a count of 5. For those of us who were used to practicing the bandhas (or locks), we were asked to do them in the hold after exhale. (Less than a count of 5 in pranayama practice is not recommended.) Ujjayi breathing was used for all of the pranayama practices (except the inhalation in sitali, which is done through a curled tongue and open mouth). Some of the pranayama practices Ramaswami introduced us to were: ujjayi, nadi sodhana, viloma, anuloma, sitali. Krishnamacharya had Ramaswami do shanmukhi mudra each time after his pranayama practice. Sanmukhi mudra helps to quiet the senses and allows us to observe the state of calmness or distraction in our minds. In shanmukhi mudra, our thumbs close our ears, our little fingers rest at the corners of our mouths, our ring fingers slightly close the nostrils, the second fingers rest lightly on the lower eyelids (with our eyes closed), while our first fingers rest lightly on the upper portion of the eyelids. We may keep our minds focused either on the breath or on the silent repetition of the mantra “OM.” (A mantra is a sound that protects the thinker, whether it is said silently or aloud.) Ramaswami said that once we make the choice of either the breath or the mantra “OM,” we should stick with it for the full five minutes. If our arms began to tire, we may lower them for a few moments, then return them to the main position, in which the elbows and arms are raised to shoulder level. Ramaswami defined dharana as the ability of the mind to focus on one object (a space, an object, the breath, the mind itself, etc. ); dhyana as the state in which the mind can easily focus on one object moment after moment, eventually in a continuous, habitual way; and samadhi as the state in which one completely forgets the self, and only the object remains. One final note: Ramaswami related to us that his teacher, Sri T. Krishnamacharya, always stressed the importance of a balanced practice. By that, he meant that a yoga practitioner should practice all of the eight limbs of yoga, and not focus on only one limb. The emphasis on asanas, for example, will change according to the age of the practitioner. For children and young adults, there is a greater emphasis on asana practice. For older people, greater attention is given to pranayama and meditation. And for those in the middle years, a balance of asana, pranayama and meditation is suggested. During the middle years, Krishnamacharya recommended doing asanas for only about 60% of one’s practice time, the other 40% being devoted to pranayama, pratyahara and/or chanting. This article has touched briefly on some of the very rich details Srivatsa Ramaswami presented to us. 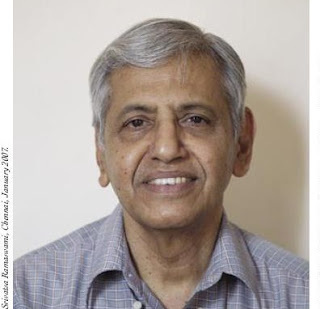 If you would like to learn more about Ramaswami’s approach to yoga, I would highly recommend his books: Yoga for the Three Stages of Life, The Complete Book of Vinyasa Yoga and Yoga Beneath the Surface (co-authored by David Hurwitz). Pam Hoxsey has been practicing and studying yoga for 35 years. She has studied asana, chanting and the Yoga Sutras with Ramaswami. She is the author of Patanjali’s Yoga Sutras: Based on the Teaching of Srivatsa Ramaswami, which is a record of her one-on-one study with the vinyasa yoga master.